I have a very exciting post today because not only am I sharing my thoughts on a luxury skincare item, I also have a second bottle of it to give away to one of my lovely readers! The people at Mizspa kindly contacted me to ask if I would be interested in trying one of the luxury skincare products they sell - SK-II Facial Treatment Essence and also if I would like to run a giveaway here on my blog so, being the skincare lover that I am, I jumped at the chance! Mizspa is a site where you can buy luxury skincare, hair care, fragrances and watches at reduced prices. Everything is guaranteed authentic and they offer free shipping on all orders or a 20% discount on your order if you sign up to their mailing list to become a VIP here. I had never tried any SK-II products before but they were always on my radar as their reputation for effective, luxurious skincare products is renowned. All of their products contain Pitera™ which is exclusive to SK-II products. The story behind this ingredient is really fascinating - aged Sake brewers were noticed to have wrinkled faces but soft, youthful hands, which baffled scientists so in the 1970s, they began to research which exact yeast in the Sake held the secret and they eventually uncovered Pitera™. 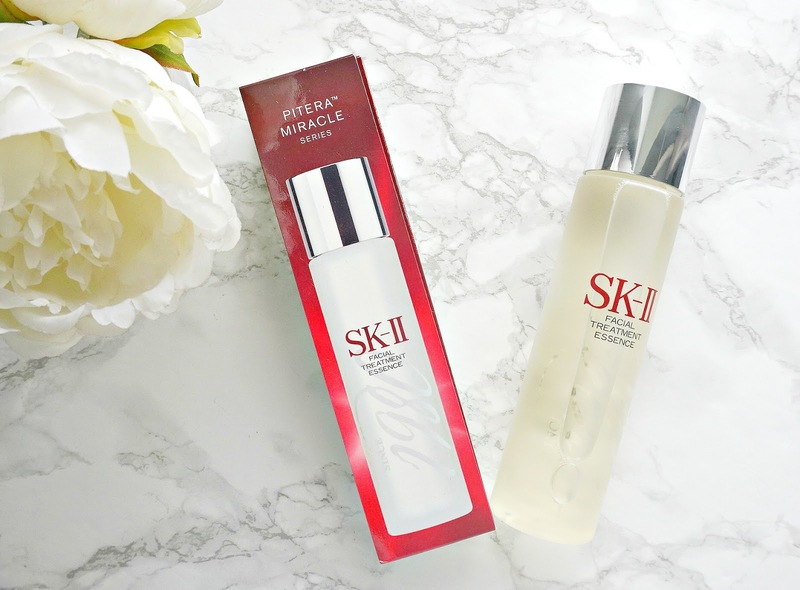 SK-II Facial Treatment Essence is made up of 90% Pitera™ which is why this product is known as a miracle water. I have only used one essence before this and it made a huge difference to my skin in terms of dehydration so please don't think that essences are gimmicks if you haven't tried them. This Treatment Essence arrived at the perfect time for me as I had a really bad breakout and reaction to a moisturiser I was trialling (and subsequently binned!). My skin was inflamed, sore, uncomfortable, spotty, red and angry so I was both eager and anxious about trying this essence as it was either going to be the perfect or worst time to try it. After cleansing and toning, I have been applying Treatment Essence on a cotton wool pad and then smoothing over my face for 1 minute, gently patting it in. I then continue with the rest of my skincare regime. Since I began using it, my skin has been much calmer, less angry, less red, soothed and the healing process began quite quickly helping my skin to return to its former clear and soft self. Time will tell if it works on firming the skin and I will update you on that in a few months. This 250ml bottle's RRP is $249 but it Mizspa sell it for $149.99. I would expect a bottle of this size to last at least 12 months. There are seven mandatory steps to take, all of which are detailed in the Rafflecopter widget below. You must follow me on Bloglovin, Twitter and Instagram and you must follow Mizspa on Twitter and Instagram plus you need to visit their facebook page. All of the links are in the Rafflecopter widget. You also must tweet the giveaway link (also in the Rafflecopter widget). If you don't complete steps 1-7, your entry will not be valid and will be deleted. If you follow and then unfollow, your entry will not be valid and will be deleted. If you leave a section blank or with N/A, your entry will be deleted. There are a number of ways to earn extra entries: Like and comment on the Instagram photo, save this post on Bloglovin, follow me on Pinterest, pin the giveaway picture on Pinterest, comment on this post telling me what your favourite skincare product is and comment on any other blog post. These are optional but all are worth five extra entries each. The giveaway will end on June 6th at midnight and the winner will be chosen via random.org. I will then contact the winner who will have 48 hours to respond to my mail. If the winner does not respond within 48 hours, they will be disqualified and another winner will be chosen. If you are under 16, you must ask the permission of your parent/guardian to enter as you will have to disclose your address. This giveaway is open internationally. Mizspa have very kindly provided the prize. I am not responsible for any items that maybe get lost in the post, however I will retain proof of postage. I am also not responsible for any customs fees but it will be marked as a gift. All products are bought by me, unless otherwise stated. This product and the prize were supplied by Mizspa on this occasion. Opinion is always my own.